This morning has been mild, sunny and still. 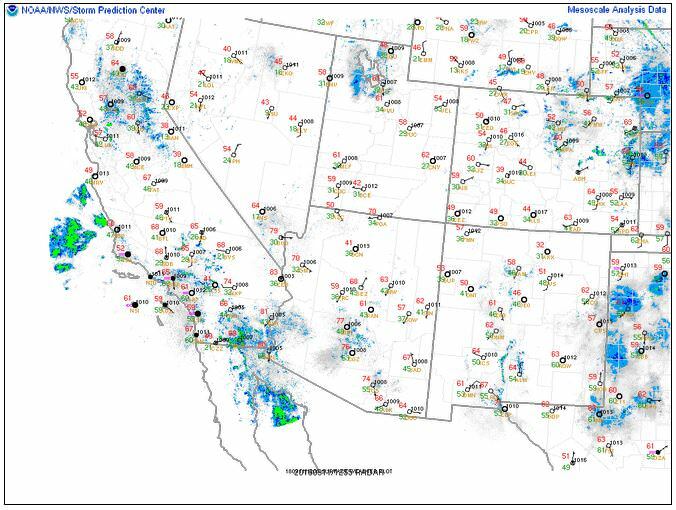 The NWS in Albuquerque, NM, forecasts (for Rio Rancho, NM) a sunny day, with a high temperature near 90 F. Winds will be from the northeast at 5-10 mph, becoming southwest in the afternoon. Tonight will be partly cloudy, with a low temperature of 60 F. Winds will be from southwest at 5-10 mph, becoming light after midnight. 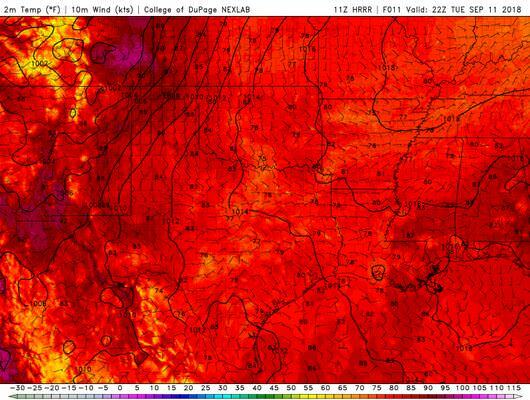 The NWS in Albuquerque, NM, forecasts (for Socorro, NM) a sunny day, with a high temperature near 91 F. The winds will be from the south at 5-10 mph. Tonight will be partly cloudy, with a low temperature of 61 F. The winds will be from the south at 5-10. 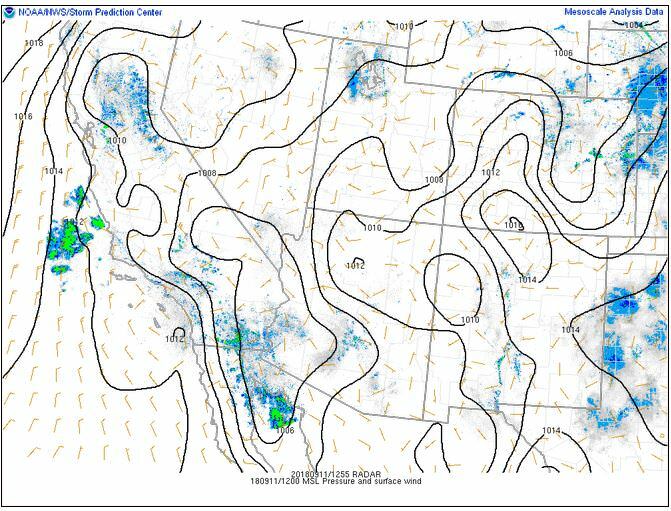 The NWS in Albuquerque, NM, forecasts (for Magdalena, NM) a mostly sunny day, with a 20% chance of isolated showers and thunderstorms, and a high temperature of 83 F. The winds will be light and variable, becoming south at 5-10 mph in the afternoon. This evening will be partly cloudy, with a low temperature of 55 F. The winds will be from the south at 5-10 mph, becoming west after midnight. The NWS in Albuquerque has issued a Hazardous Weather Outlook concerning a few thunderstorms along and east of the central mountain chain. The primary threats will be gusty downdraft winds and small hail. The chances of storms will be lower than yesterday. The 12Z upper air sounding from Albuquerque shows a moderately humid atmosphere this morning. There was 0.77 inches of precipitable water present in the column this morning. 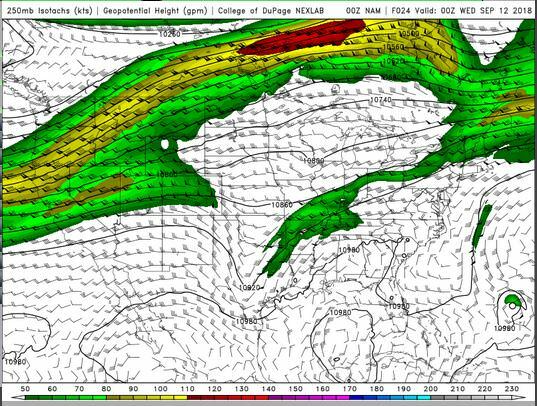 There was 9 J/kg of Convective Available Potential Energy (CAPE) and -630 J/kg of Convective Inhibition (CINH). 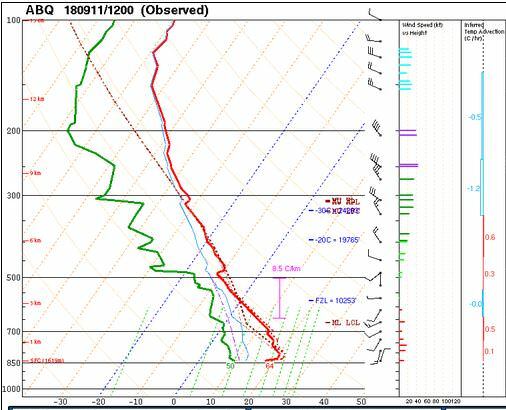 The Lifted Condensation Level (LCL) was 1026 m. There was a small thermal inversion near the surface, and the 0-3 km average lapse rate was 5.6 C/km. 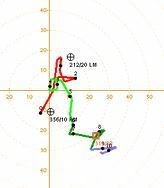 The hodograph shows that there was 26 kts low-level shear (due mostly to directional changes) and 17 kts deep-layer shear (due mostly to directional changes). 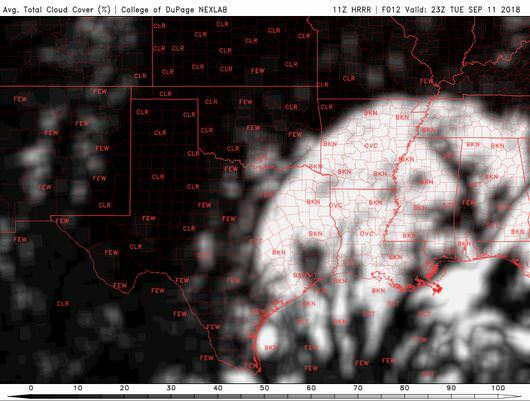 The NAM 250 mb chart shows zonal flow over the state by this afternoon. 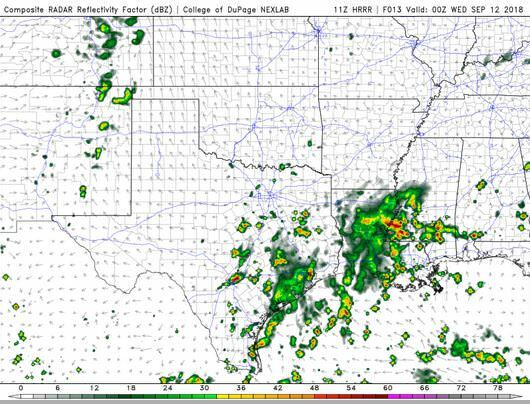 The HRRR simulated reflectivity shows a few showers and thunderstorms this afternoon, particularly over the eastern plains of New Mexico, where the moisture is richer. Coverage will be more sparse than yesterday. The HRRR shows that today will be dry again today, with dewpoints in the 30’s F for most of the day. Today will be hot, but not as humid as it was this time last week. On a side note, I will be watching the hurricane closely. I may take a break from posting about the NM weather as the hurricane approaches land. 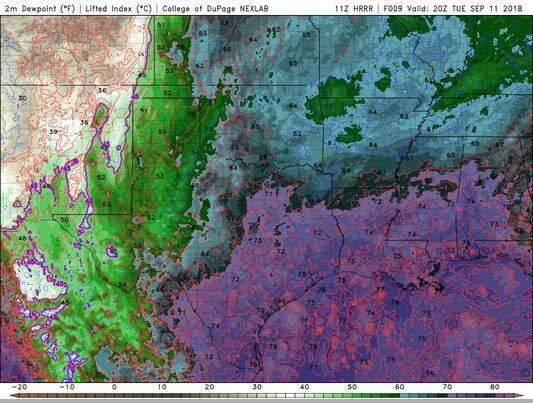 This entry was posted in Local WX, Practicing Concepts, Predictions, Satellite Imagery and tagged albuquerque, Belen, forecast, Los Lunas, magdalena, New Mexico, nmwx, rio rancho, Socorro, weather. Bookmark the permalink.